This entry is part 5 of 8 in the series Euro Summer 2013. While planning a trip to Paris with my best friend last summer, I knew we’d be visiting many of the tourist sites I had seen in the past. 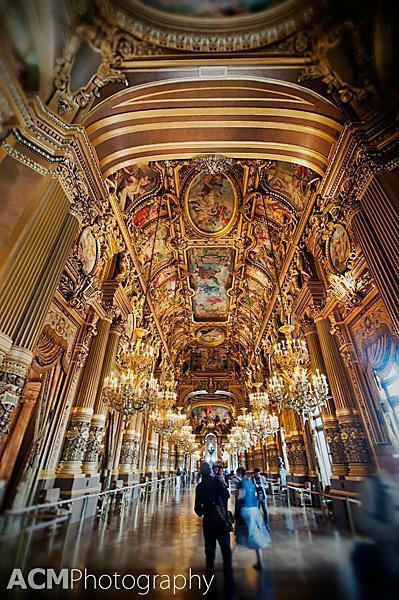 One of her requests however, was a new one for me – The Palais Garnier, Paris’ famous opera house. Travelling with friends can be an eye-opening experience. 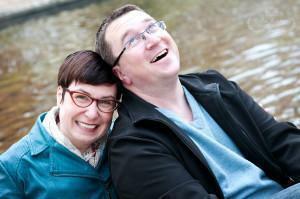 The act of compromising on which sites to visit can expose you to some unexpected places. After half a dozen trips to Paris, I thought I had seen all the main sites, but it had never occurred to me to visit the opera house. 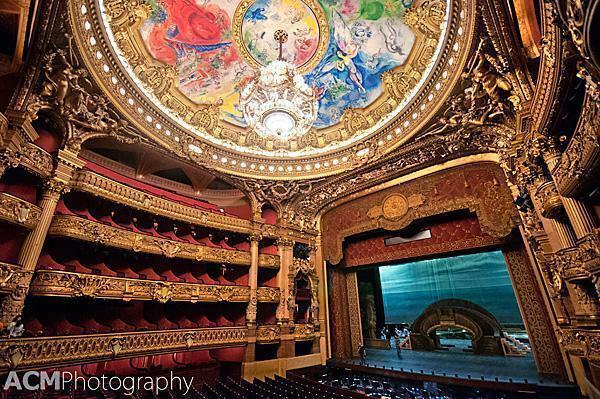 I love theatre, art and architecture so the Palais Garnier turned out to be a real treat. 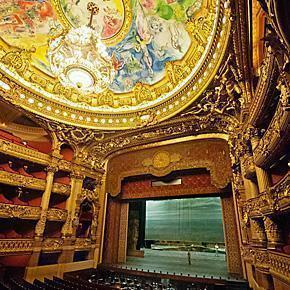 Beginning in 1861, The Palais Garnier, in Paris’ 9eme arrondissement, took 14 years to build. 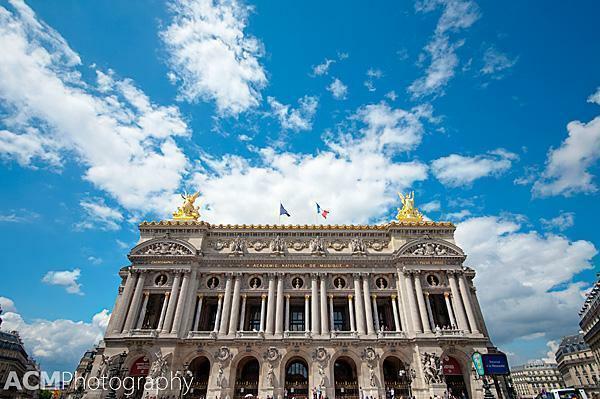 Named for its architect, Charles Garnier, this gorgeous building is also called Opéra Garnier or the Opéra de Paris. For many years, it was home to the Paris Opera Ballet. However in 1989 the ballet moved to the newly built Opéra Bastille. Stepping inside the opera house, we first made their way up the Grand Staircase. 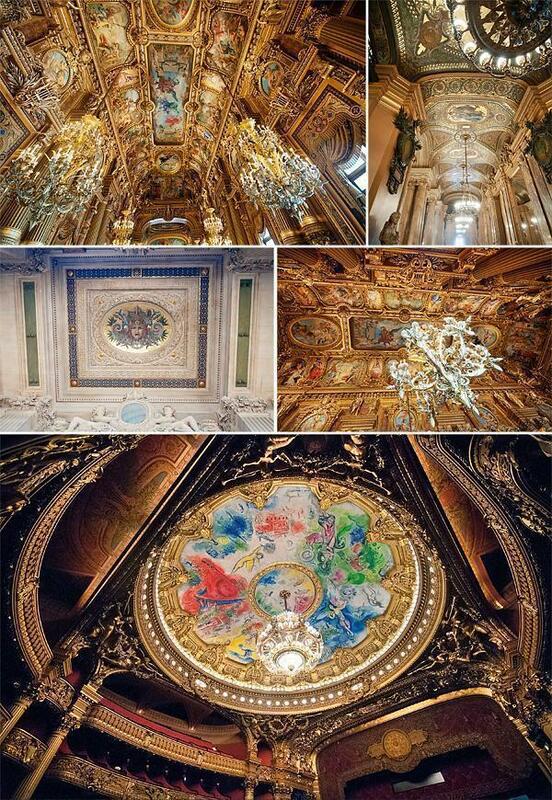 The high ceilings are decorated with murals and dripping with chandeliers. Sculptures decorate every nook and cranny and gold-leafing glows in the warm light. This staircase has definitely earned the name Grand. From the staircase, we entered the auditorium and were rendered speechless. Every inch of the theatre is draped in rich red velvet and accented with gold. But looking up we saw the real stunner, dangling from the ceiling, the 7-tonne chandelier. The Palais Garnier is the setting of The Phantom of the Opera, a novel written by Gaston Leroux and made a household name by Andrew Lloyd Webber’s musical. The famous chandelier scene was based on a real event in the opera house’s history. One of the chandelier’s counterweights came crashing down, through the auditorium ceiling, tragically crushing an audience member. The chandelier was replaced and audience members still sit under it today. The Marc Chagall mural circles the 7-tonne chandelier in the Opera’s Auditorium. For me, however, it was the mural surrounding the giant chandelier, which stole the show. In 1964, Marc Chagall (one of my favourite artists), created a colourful depiction of opera scenes from 14 different composers, including Mozart, Wagner and Beethoven to name a few. Although some critics feel the mural doesn’t fit with Garnier’s original design, I love the mural’s swirling figures and brilliant colours. The ornate architectural design doesn’t end with the auditorium. There is also the Grand Foyer. (Notice every room is Grand?) This long corridor could rival Versailles Hall of Mirrors. 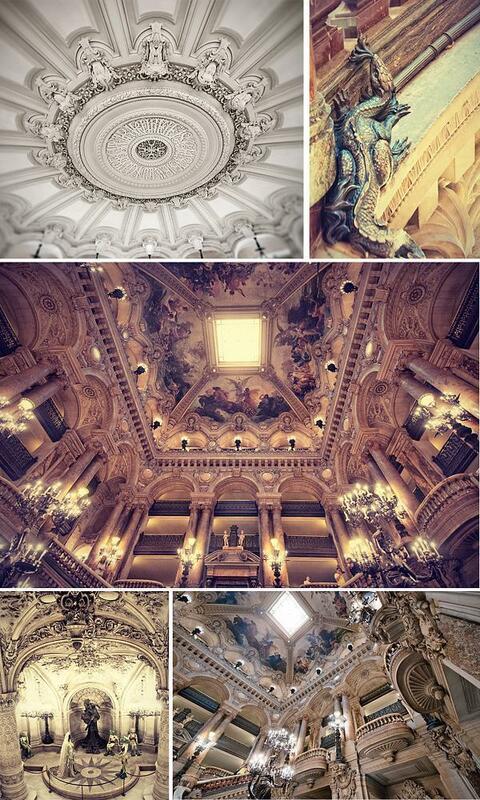 By this point in our tour we were getting cricks in our necks, from staring at the incredible ceilings. Most of the Palais Garniers finest features are over your head. 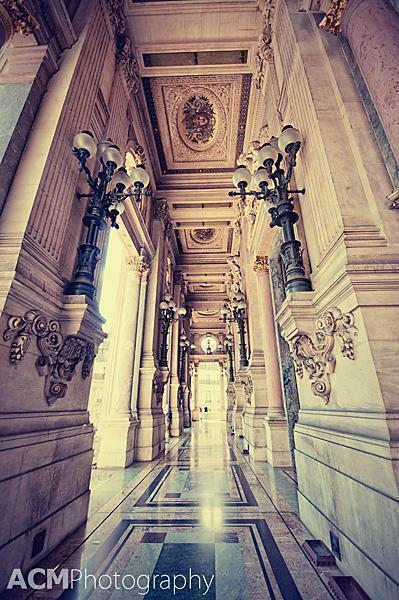 The foyer opens onto a sweeping balcony, overlooking the bustling Avenue de L’Opera. Overhead are bronze busts of famous composers and delicate mosaic tile work. The exterior balcony is almost as ornate as the interior. Knowing my love of books, I couldn’t help but pause for a moment in the library. 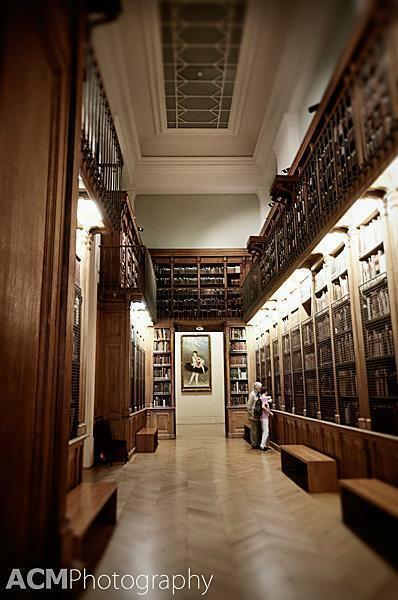 The Bibliothèque-Musée de l’Opéra National de Paris is managed, these days, by the Music Department of the National Library of France. It reminded me of a small scale version of the Trinity College Library in Dublin. It was a magical place to visit. In the end, rather than feeling like I compromised by visiting the Palais Garnier with my friend, I felt like she led me to an incredible new corner of Paris. I’m sure the beautiful Paris Opera house will be on my ‘must see’ list for future visits to Paris. I probably never would have visited the Paris Opera without the urging of my friend. Closed January 1st, May 1st, and when a special event is scheduled. *From 10:00 am to 1:00 pm when a matinee performance is scheduled. From July 16th until September 2nd included, visits will close at 6:00 pm (last admissions 5:30 pm). Have you ever visited a tourist site with a friend, you wouldn’t have gone to on your own? Tell us about your experience in the comments below.